You’re confused about men’s aftershave. Is there a good reason to use it? Is aftershave the same as cologne? As a barber, I get these questions all day. So, I decided to write up a guide on what is aftershave, what it is good for and why it should be in your post shave routine. It may seem like men’s aftershave is just a way to smell nice after a shave. But the fragrance is merely a bonus. An aftershave is an integral part of the shave and shouldn’t be skipped. If you don’t like the smell, not to worry. There are fragrance free aftershaves and also aftershave alternatives that we will explore. 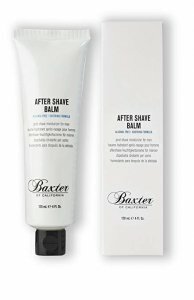 Before I get into the meat of the article, I’ll give away some of the suspense and tell you that I think the best aftershave balm is Baxter of California from Amazon.com. I’ll go into more detail about why later in the article. What is Aftershave For and What Are the Benefits? Many guys think that men’s aftershave and cologne are interchangeable and the main reason to use aftershave is to smell nice. I’ll go into more detail about the difference between cologne and aftershave, but for now let me say that there are some very practical reasons for using aftershave. A few things happen when you shave. First, your pores are wide open from having been warmed and hydrated for the shave. Then, your skin gets quite exfoliated, exposing the newer, more sensitive skin underneath. Lastly, any bacteria that was on your face, whether from acne, or even from your razor blade, gets spread across to all areas. A good men’s aftershave addresses all of the problems. When you shave, your razor, if you are using a good one, is cutting the hair right down at the root. To make the shave a smoother one, and your skin feel like a baby’s bottom, you need to close up those pores so the hair is well underneath the layers of skin. Your skin will feel incredibly smooth and it will take longer for the stubble to start poking through. All of this is made easier by the toning and astringent qualities of men’s aftershave. Most people think of the burn of aftershave because it is usually alcohol based. Alcohol will cause your skin to contract over the follicles and give you a smooth shave. There are other ingredients that can do the same thing as alcohol without feeling that burn, but I will go into more detail about that later in the article. The best aftershave balms and lotions these days contain ingredients like aloe vera that will help your new, sensitive skin get the hydration it needs to stay plump. Your new skin will also feel very sensitive. Many men feel some razor burn and irritation even when they do a great shave. If you already have sensitive skin, then think of how much more sensitive that skin that is newly exposed must be. Reduces the irritation will help your skin feel cool and refreshed instead of hot and burning. You may not even realize just how much bacteria is lurking on your skin. Most guys do not use a good face wash regularly so they often have a lot more bacteria than women do. Even if you don’t have acne on your face, you are spreading it around when you shave. Not to mention that unless you are cleaning your razor off in an alcohol solution after every use, you have a nice colony of bacteria there just waiting to be loaded onto your skin. To keep this bacteria from getting into your pores, you need to kill them on the spot. This is where a men’s aftershave comes in. It has antimicrobial properties that will eradicate any bacteria that will cause your skin to break out. What is Aftershave Made From? The very basic ingredient in aftershave is an astringent. Technically this is the only necessary ingredient when you are looking to use it post shave for the reasons I mentioned in the last section. It’s just an ingredient that tightens the skin to smooth it out and to tone it. The two most popular astringents in men’s aftershave are Witch Hazel and alcohol. These are in just about any lotion. The best aftershave balms may also use tea tree oil. In fact, lately many aftershaves also contain essential oils to moisturize, heal and nourish the skin. 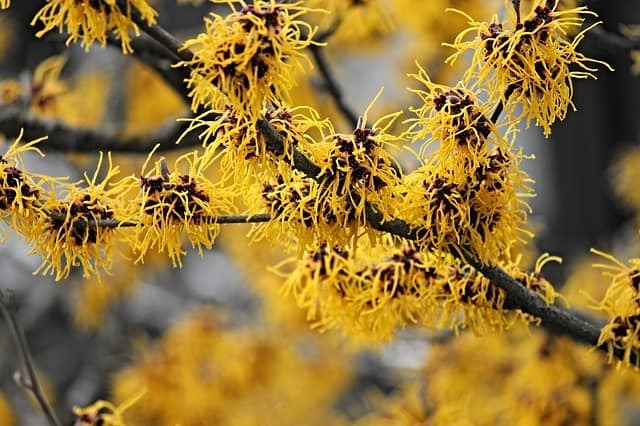 So, yes, you could use straight up Witch Hazel as an aftershave alternative, but these days the best aftershave balms and lotions all have other properties besides just an astringent. Aftershave vs Cologne | What’s the Difference? This is probably the most common question I get in the barbershop regarding aftershave. There is a huge difference between them and they can’t really be swapped for each other. Namely, the biggest difference is their purpose. Aftershave is meant to be used as a post shave product to cleanse the skin of bacteria, tighten the pores and to hydrate the newly exposed skin. It has a practical purpose. The scent is totally secondary and is not at all necessary. And some men’s aftershaves are creams like a balm that are meant to be rubbed into the skin and not just applied on the surface. Cologne, on the other hand, is simply an ornament. Its entire purpose is to smell nice. There are no cosmetic benefits. There are no health benefits. It serves no practical purpose at all, unless you really need some aromatherapy to give you a lift during the day. Then there is a difference of ingredients. Men’s aftershave has an astringent, as I already mentioned. Plus in some cases other ingredients either for hydrating or for fragrance. Cologne also has alcohol in it, but it is meant as a carrier for the essential oils of the fragrance. The best colognes have natural fragrances that are distilled in alcohol to bring out the aroma in a flower, spice or other product. There are varying strengths of the alcohol depending on whether it is an eau de cologne, eau de toilette or an eau de parfum. I wrote a more detailed article about men’s colognes that you can read here if you want to know more details. Now, the price is also a big difference. Considering you can spend upwards of $1,000 on a cologne, the sky’s the limit. An aftershave is typically under $15 and that price is usually reserved for the best aftershave balms. So, you can really spend very little on a men’s aftershave. Spending only a small amount on a cheap cologne is a bad idea. A bad cologne will have the opposite effect that you are going for. Though I don’t recommend spending too little on the cheapest aftershave, a good one won’t set you back too much. Lastly, and probably most importantly, the difference is in how long they last. Your typical aftershave will only smell bright and noticeable for maybe an hour. That is the upper limits of the duration of the fragrance. Typically you will only get about 30 minutes of some nice aroma. A cologne, on the other hand, lasts all day when you get a good one. And the scent changes throughout the day as it evaporates and reacts to the changes in your body heat and oils that come out of your skin. You don’t use a men’s aftershave to smell nice. If that is the sole purpose you are going for then you need to go click that link I just posted to the article about men’s colognes since you aren’t going to be satisfied with how long the aftershave scent lasts. There are two schools of thought regarding men’s aftershave. Some guys love the burn. They wonder what is aftershave for if it isn’t going to make you wonder if you are secretly a masochist. Other guys are looking for mellow and soothing to do essentially the same thing. A common misconception is that if you don’t feel that familiar sting that surely your grandfather also felt, then it isn’t doing its job. Let me dispel that notion right away and say that the best aftershave balms that don’t give any tingle or burn are still working just as well. There is a fierce debate surrounding alcohol in aftershave. It is the way it has been made since people started using it. As I mentioned, your Grand Pappy definitely grew hair on his chest thanks to the alcohol burn he got from his traditional after shave. Even though it works awesome as an astringent, it is not totally necessary to have as an ingredient. In fact, it can dry out your skin after your shave. It works great to kill bacteria and to tighten your pores but does little to calm irritation and obviously doesn’t hydrate your skin afterward. If you love the burn, then go for it. Just take a look at the other ingredients. Make sure it has some moisturizers in it like aloe vera or glycerin. Usually, I try to steer guys away from grooming products with alcohol, but this is one of those cases where I think there is a good reason to have it as an ingredient. I, for one, love the burn. Another benefit I enjoy from an alcohol based aftershave is how quickly it dries. Made from a shrub, this has been a tincture used for centuries as an old wives remedy. It works great as an astringent to tone the skin and tighten the pores so you end up with a smoother shave. It does more than just that, though so it is a very good substitute for alcohol. It can even act as an anti-inflammatory. If you have any skin conditions like eczema, psoriasis or acne that get really uncomfortable when you shave, you will get some relief by using this as a primary ingredient. It also is great at treating irritated skin. When you have razor burn it will soothe your skin and calm it down quickly. Alcohol definitely makes this worse. Lastly, it helps keep bacteria from entering the pores. Mainly because of the astringent properties that tighten the skin, closing the pores. But, also because of its ability to disinfect your skin. This is a resin from the sap of a tree or shrub. There are a lot of different kinds, so I won’t bother going into all of them. You’ll find balsams in many hair conditioners as it is excellent at moisturizing your hair and skin. Many of the best aftershave balms have balsam. It gives a bit of a tingle which replaces the burn of an alcohol nicely. Frankincense and Myrrh are types of balsams. Since you’ve done some damage to the outer layers of your skin and stripped the old cells away, you need to quickly repair it so it doesn’t sting. Look for men’s aftershaves with a dose of aloe vera as it is an excellent moisturizer for your skin. It helps soothe irritation and keep your skin plump in the process. Since it is absorbed quickly, the best aftershave balms use it to avoid that greasy feeling. Other ingredients to watch out for are Vitamin E and essential oils like sweet almond oil and chamomile. I kind of don’t understand why you wouldn’t just use a men’s aftershave, but since so many people ask me if there are alternatives, I decided to write in this section. What is aftershave for but a way to tighten the pores and disinfect the skin. Since there are more ways to skin a cat, try one of these other options. It is a great way to disinfect the skin, but it can be strong on its own. Dilute it with equal parts water and then let it sit a few days. You can add some essential oils so it smells better, but honestly, you won’t shake that vinegar smell. I already went over the properties of Witch Hazel in the last section so I won’t repeat it. But, instead of using a Witch Hazel based balm or lotion, you can use it straight. Just put some on a cotton ball and rub it over your face post shave. This is seriously old school. Unfortunately you may not be familiar with it since it is not allowed to be used in barbershops these days. In Italy, they take a block of the stuff, wet it and rub it over your face after you’ve shaved. It tighten up the skin like no other product. It also creates an environment where bacteria can’t survive so it disinfects very well. It is dirt cheap and has no smell whatsoever. Take a look at the price on this one on Amazon.com and you’ll see what I mean. And this stuff lasts forever, too. What is aftershave for but to do exactly what alum does. It’s just a very basic way of achieving the same thing. 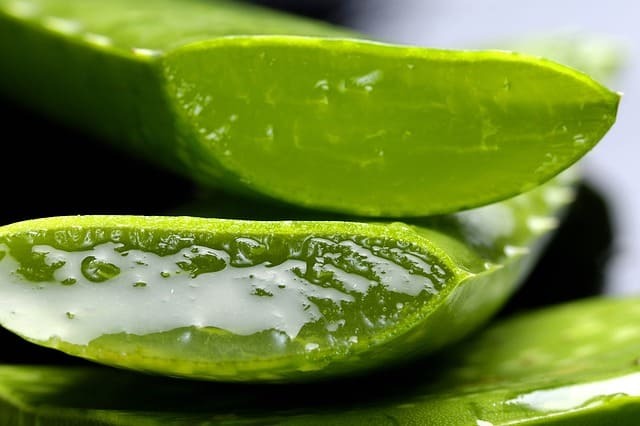 Aloe vera is great at moisturizing and soothing irritated skin from shaving. Where it comes up short, however is with toning the skin and disinfecting. So, my suggestion is to grab a bottle of aloe vera oil from Amazon.com and add it to your favorite Witch Hazel. Now you have an effective, economical and fragrance free aftershave alternative. What is the difference between aftershave lotion and balm? The biggest difference is texture. An aftershave lotion is a liquid that can be poured onto the palm of your hands. Or, it can be sprayed by an atomizer. What is men’s aftershave lotion good for? It is usually alcohol or Witch Hazel based so they dry quickly as it evaporates rather than getting absorbed by the skin. They go on without any greasiness. And some guys just love that bracing effect of the burn to know it is working. A balm on the other hand is a cream or gel that gets applied to the skin by rubbing it in rather than splash or spray. The best ones go on easy and are quickly absorbed by the skin, but cheap ones can feel greasy and take too long to dry. What is aftershave balm good for? It will soothe the skin without any burning or stinging. Some makers add a bit of menthol for those that want to feel something like the invigorating effect of aftershave lotion. It is great for the scent as it doesn’t evaporate quickly like with a lotion. What is the Best Aftershave Balm? Applying it is easy to do as you only need around a pea sized amount on your hands to rub into your face. It is quickly absorbed and doesn’t leave the skin feeling greasy. With some additional menthol, it has a nice tingle to feel refreshing and invigorating without burning like an alcohol lotion. There is no alcohol to burn or irritate the skin after shaving. It has glycerin and aloe vera to help moisturize the skin instead of drying it out like an alcohol based one would. A bit of tea tree oil acts as the disinfectant that alcohol would cover. The smell is not overpowering, so if you are looking for a scent to compliment you or to impress a special somebody, then this is not going to do it. It does have a fresh, light citrusy scent that is very refreshing, however. Remember, that is not what is aftershave for. The scent is merely a bonus. A nice runner up is the Pro Raso line of men’s aftershave balms. I love all of their shaving products and their aftershave balms do not disappoint. You can check some of them out here on Amazon.com. What is the Best Smelling Aftershave Lotion for Men? I think half the point of using a men’s aftershave is the old school manly scent. Like this list of the best bay rum men’s aftershaves. If you aren’t into the bay rum thing, then here are a couple whose fragrances I really love. 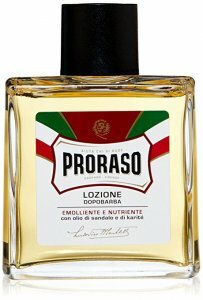 Pro Raso sandalwood men’s aftershave is right at the top of my list for the best smelling. It has that classic barbershop scent that gives you that old school cool smell. And it isn’t just that it smells nice. It has everything you need to make it a great choice for an effective post shave lotion. This is a Witch Hazel based formula that tones, tightens and soothes the skin. To add to the disinfection Pro Raso added some eucalyptus oil to combat any bacteria. It also adds a nice menthol tingle to replace the burn that is missing without alcohol. With a bit of shea butter, your skin gets hydrated and feeling plump and smooth after your shave. Your skin will feel soft and elastic just as you would expect from a balm, but instead it is a lotion. Though it isn’t an all natural formula, they have stayed away from parabens and mineral oils so it doesn’t have any harsh chemicals. A runner up for the best smelling men’s aftershave lotion is Taylor of Old Bond Street. In fact this was a very close second as I really love the light and refreshing fragrance of the citrus and herbal notes. You can pick it up here from Amazon.com. I firmly believe that no man’s grooming kit is complete without a good men’s aftershave. It is essential in other words. I already explained how a men’s aftershave is necessary to complete the shave. If you want a smooth shave with great feeling skin afterwards then there is no substitute. This is what aftershave is for, not just to smell nice. I hope that you’ve learned a bit about how to choose the right men’s aftershave and why you need one. If you have any questions about these aftershave balms and lotions, or any other ones then go ahead and drop a comment in the box below. I could talk about old school barbershop scents all day! Check Out Our Guide for the Best Small Beard Styles!